Thanks Judy. The strong colors just appealed to me today. 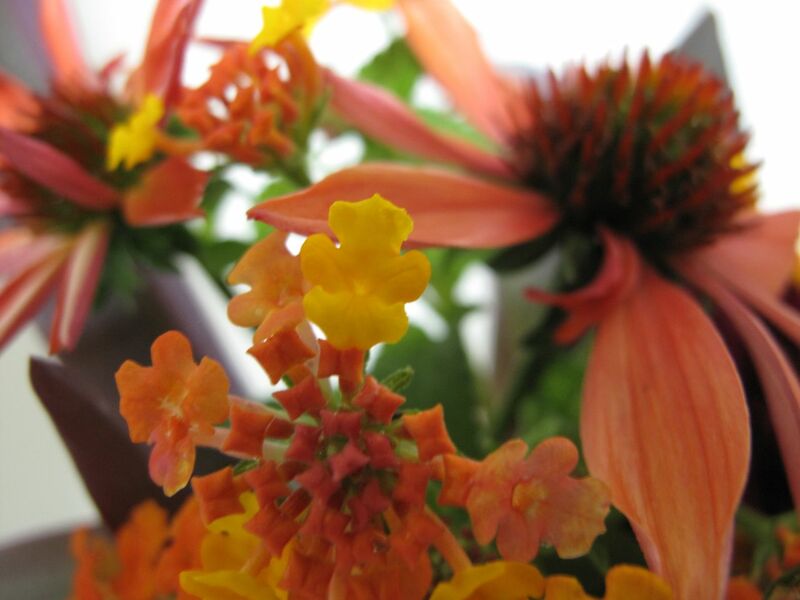 I really love the colors and how they especially coordinate…love lantana and Sundown echinacea…wish mine was still blooming. A really stunning colorful vase!! Thanks Donna. The lantana should keep going here until first frost about last week of October. I’ll be grateful for the color in the garden. Don’t know how you did it, but thanks! Do you owe me one? 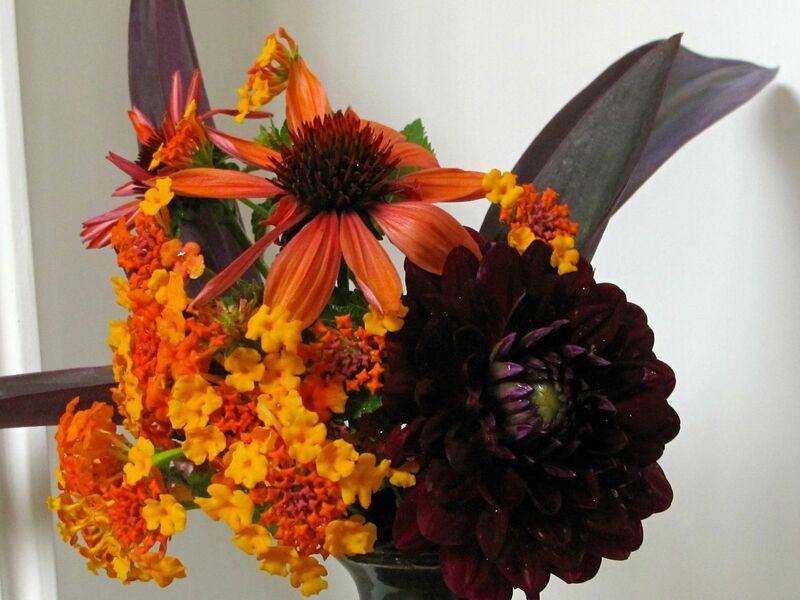 A perfect arrangement for the soon to arrive autumn. Thanks. Yes, there are signals of autumn’s impending arrival but I’m not ready. 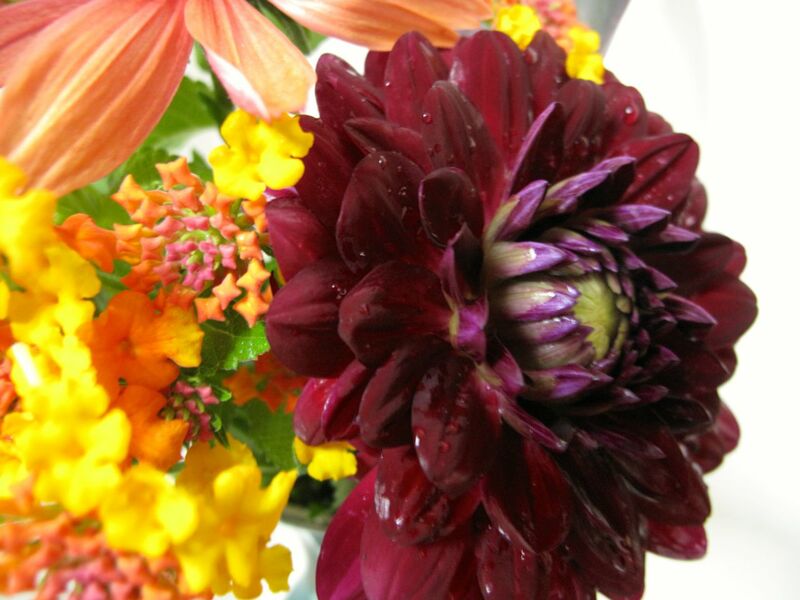 The color of the vase sets off the flowers beautifully, Susie. You have the most wonderful collection of vases (as well as baskets). Thanks Kris. We have excellent potters in this area. I used to pick up little, inexpensive ceramic vases at local street festivals and they seem like old friends when I reach for them to fill with flowers. I love the rich colours you’ve chosen to go with the Lantana – especially the long purple leaves. Another inspiring idea, as I had never considered using that shape leaf before! Thanks Cathy. The color of that purple heart ground cover drew me to it yesterday–seemed like it would work with the dahlia, but the shape of the leaf became an important element. Congratulations on the rain, I know just how you feel when rain finally arrives after a long period of drought. 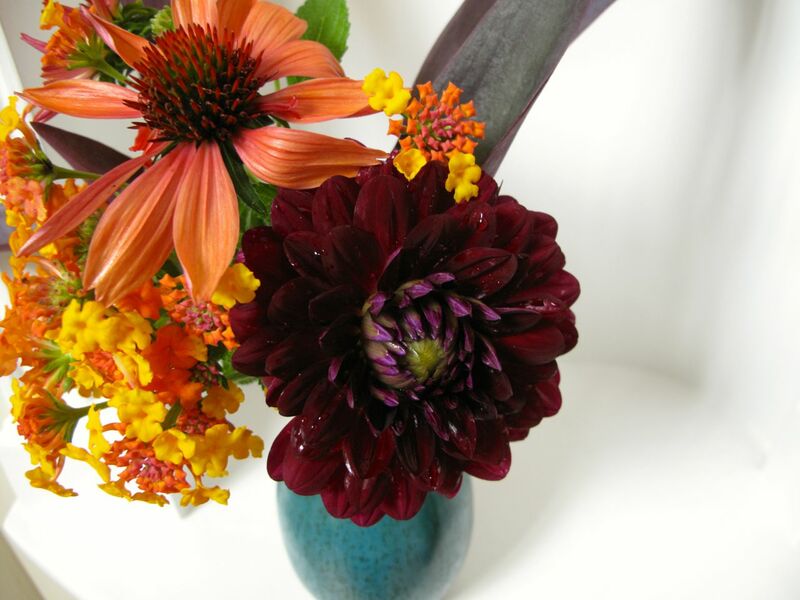 A wonderful contrast of colour in this weeks vase Susie and the vase sets them off to great advantage. I will plant more Dahlias next year but I have no idea what to choose from the vast array available. The garden and I breathed a collective sigh of relief for the rain. I, too, would like to grow more dahlias next year. I’m overwhelmed when I peruse the garden catalogs that have been arriving lately. 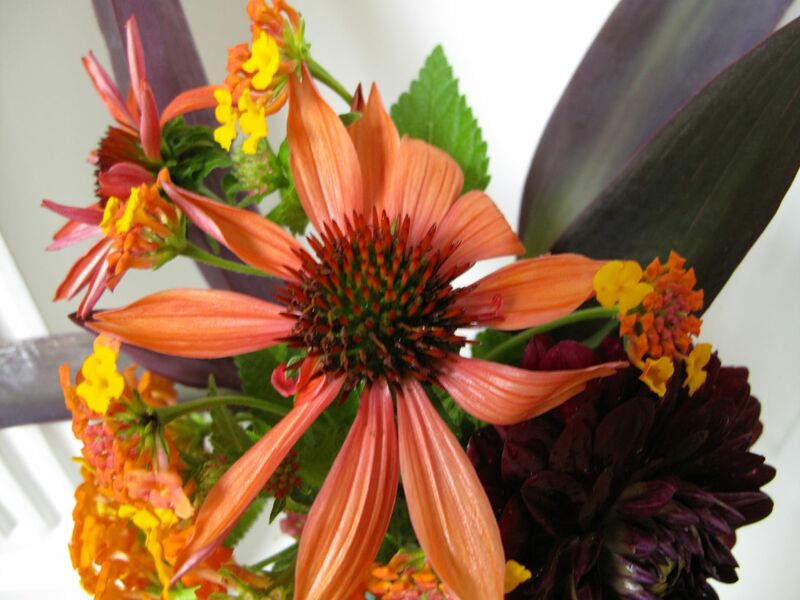 There are so many options in every type of plant it is hard to make a decision. Glad to hear you finally got some rain. We had a good bit here too, along with cooler temperatures.. Love the bold colors of your arrangement; the blue vase sets them off nicely. Thanks Marian. I think this vase will hold up well so we can enjoy a punch of color all week. Wasn’t the rain wonderful? The lower temps are a relief too. Now perhaps I will feel like being in the garden a little more. Love the color contrasts you created. This is not my strength, I am really learning a lot about color and how to use it more effectively. I usually work with more subtle colors but working with flowers frees me up a bit to experiment. Why not join in next week–you’ll be surprised how rewarding it is. A great colour mix.Love it. D.
Lots of you in the US seem to have had welcome rain this week. 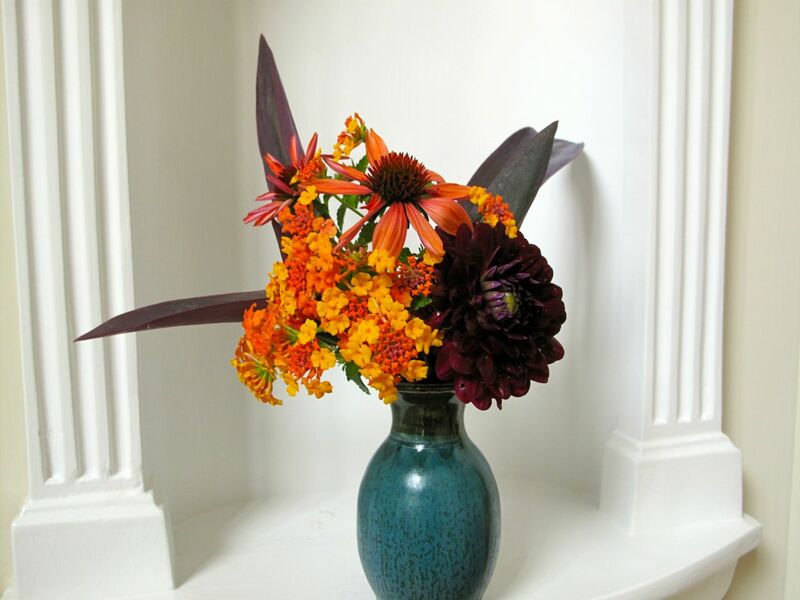 Your vase is indeed bold – those dark leaves were perfect for offsetting the flowers, and the variable shades of lantana are such an asset. It seems the UK equivalent of lantana is verbena but I have not seen it in these bright colours. Thanks for another great contribution, Susie. Bold indeed! Orange and purple – I like it! Stunningly beautiful colour combination. That would cheer anyone up on a Monday. Thanks Malc. I’ve enjoyed this arrangement this week. The colors provide a boost. 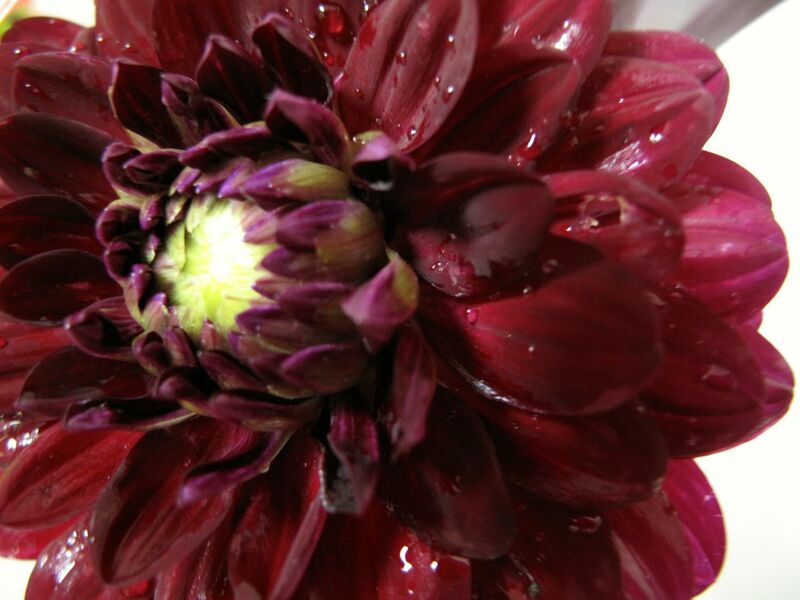 I love the color of the dahlia — it’s gorgeous. Thanks, I like it too, even if the color was a surprise.